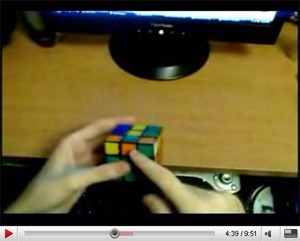 F2L is the second step of the Fridrich method for solving the Rubik's cube. In this step 4 F2L pairs are inserted into their correct positions thus completing the first two layers. F2L is an incredibly important step of the Fridrich method that can be done intuitively without the use of algorithms. It takes a while to master, but when you eventually to get into it, it will decrease your times significantly. There are 41 basic cases that you can run into if you only consider a single pair and assume everything else to be solved. See the links section at the bottom for all cases and how to solve them. Cube Rotations are to be avoided as much as possible. As a beginner you will find this hard, but try going towards reducing cube rotations to maximum of about 2-3 each solve. This PRINTABLE PAGE (pdf) contains some F2L solutions (thanks Andy!). But I would encourage you to only use the page to get inspiration. Here is a listing of some F2L techniques that you can use to get faster. Note that these are not required for you to get extremely fast. I know people that average in 12-14 aseconds and they barely use of this stuff. Instead they just turn very fast and have an extremely good look ahead. This is an important part of getting faster. Many times you want to insert into a slot other than the one in front of you (FR slot). Sometimes you want to insert to the back, or the left, etc. It is very important that you try and find good ways of doing these insertions without making a cube rotation (Even though in some cases it is inevitable). Other times you may run into a case where you paired up a corner and the edge but the slot that you want to insert it into is not in a very convenient position. For example: Do (F' U2 F) on solved cube to prepare. This took out a pair. How would you solve this pair? Probably (y' R' U2 R)? Well yes but there is also (l R U' R' U l') it can be executed very quickly with a little bit of practice. It is not always the best choice to use that insertion, but often times it is. For example if you don't see too much around the cube at the moment, you might want to do a cube rotation so that you can find your next pair. You have to insert 4 F2L pairs during the F2L stage. That means that 75% of insertions take place while at least one other slot is still open! These open slots give you additional degrees of freedom that you can (and should) use to your advantage. Consider another example: this is the case that we all hate, where the slot is filled, but edge has incorrect flip. Notice how again we are using the trick of moving the D layer to do useful things. Remeber this trick, it can be useful. Many many times you will find that corner and edge are not to be found on top, but are instead stuck in random wrong slots. It is often possible to join these pieces in some clever quick way that is usually still quite intuitive, but sometimes needs pointing out. My next example can't even be shown on a picture. To set it and solve it, do (R2 u R2 u' R2). You are trying to solve the FR slot, but the edge is stuck in the back, and even in the wrong orientation! So if you move the corner on top of it, the pair is dissaligned. What a dissaster! I bet you stumbled by that case at some point and cursed, because its a pain to solve intuitively. You can see you have a lot of work to do :). These are just examples, there are many many more cases you should look into. Check the links for the specific websites. Multi-slotting is a technique in which while inserting one pair you try to set up an easy insertion for a second pair. So in a sense you are attempting to solve two pairs at the same time, or at least make the second insertion very easy. The following example illustrates what multislotting is about. 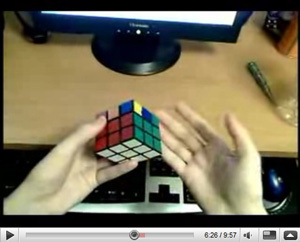 Set up your cube using (L' U' L U2 R L' U' R' L). Now to solve the front slot you may be tempted to right away just do R U R'. On the other hand, if you were multi-slotting, you would instead do an L' first, then do R U R', and then undo the L' with an L. See what happened? Not only did you solve the first pair, but you also paired up the second pair! Its ready for an extremely quick insertion now. I personally do not use multislotting because I am of the opinion that it does not provide benefit unless studied extensively. It also requires you to see way too many things around the cube, and is without a doubt the most advanced technique for F2L. Make up your own mind on whether or not you want to look into it, and do let me know of the result if you decide to try it. Check CUBELOOP (linked on bottom) for many many multislotting cases. Note also that I don't know of a single cuber that seriously uses this technique. 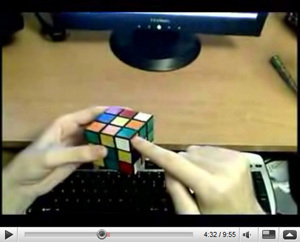 Set up your cube using ((F' U' F) R U2 R' U). You could just insert the pair using just the easiest way, U' F U F. However, if you use partial edge control, you would instead do the insertion using something like (U2 R U' R' U2 F' U F). This will orient all edges and insert that pair. This approach to finishing the last pair of F2L is called ZBF2L. CubeZone has a database of all ZBF2L cases. What you should most likely concentrate on are the base cases such as (what he calls) ConU_1a, and SepU_1a. F2L usually works by reducing to these two cases. There is yet another approach to control edge orientation. It requires no algorithms that you need to learn, but is a little bit riskier. It uses the fact that if you only turn two faces of the cube (such as U and R), you can never un-orient an edge. Petrus method uses this property in a very clever way. What you need to do is solve two adjacent F2L pairs, and then orient all edges on the cube while it is still easy, because you still have a lot of freedom in what you move. You then would proceed to solve the entire F2L only using U and R so that you don't unorient anything. If you manage to complete the last two F2L pairs like this, only using two sides (for example only using moves U/U'/U2 and R/R'/R2), you are guanranteed to get an easy OLL! Check details on how to orient edges in this way from Petrus website. CUBELOOP has a giant database of algs for Empty Slot cases, Stuck Pieces, and Multislotting. BE WARNED that some of his cases list algorithms that are just downright silly. Use your judgement when using his algorithms, don't just blindly take them all. Speedcubing Advanced F2L page has a few very nice solutions to some cases, mostly Stuck Pieces cases.